Home : Beauty Tips : Can Bone Broth Give You Glowing Skin? Bone broth has been steadily gaining popularity over the last few years—and it only seems to be getting more famous. From Gwyneth Paltrow to Kobe Bryant, celebrities are hyping the health benefits of this dressed up stock, and our very own Dr. Buford is a huge fan himself. 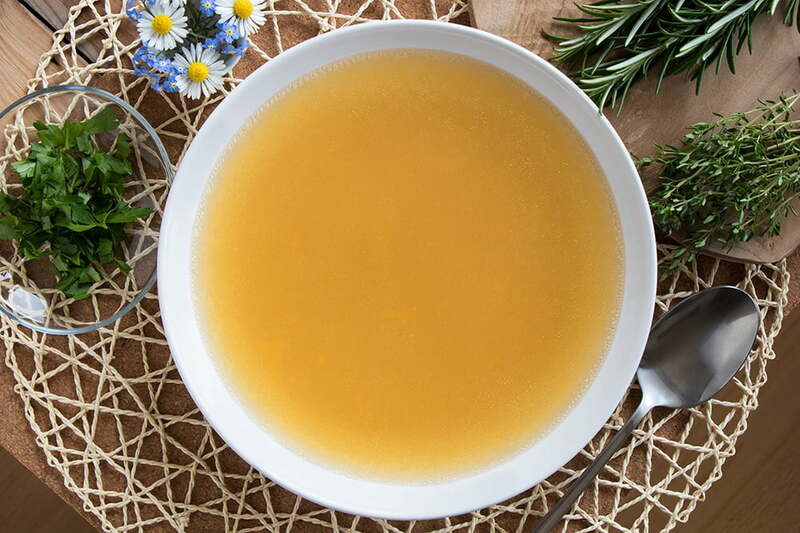 Bone broth—a fragrant stock made from animal connective tissue and bones, usually cows, chicken, or fish, plus vegetables and herbs for flavor—is purported to improve gut health, reduce inflammation, aid in healing, and boost energy levels. It’s chock full of amino acids, protein, and collagen. That last ingredient was the focus of a recent article on RealSelf, “Can Bone Broth Give You Glowing Skin?” Here’s what they determined. Essentially, collagen and elastin are the building blocks of your skin. As we age, our natural reserves decline, leading to skin laxity, wrinkles, and loss of suppleness—basically, a decrease in all the visual signposts of youth. This collagen breakdown can begin as early as your twenties, and the process can be sped up through lifestyle choices like poor diet, smoking tobacco, and too much time in the sun. Because bone broth contains a large amount of collagen and gelatin, consuming broth may help support your body’s ability to create collagen and help keep skin strong and youthful for longer. There are many topical, anti-aging collagen products available. While these are great for adding moisture to the skin, the collagen molecule is usually too large to penetrate the skin and impact the way it functions—basically, it just sits on top. Ingesting collagen through bone broth or supplements, on the other hand, may increase your body’s ability to absorb all the good stuff, improving the appearance and function of your skin (along with your joint and gut health!). We still have a long way to go in terms of studying the health benefits of supplemental, ingested collagen—whether it’s in the form of bone broth or not. And while one cup won’t give you gorgeous, glowing skin right away, there’s no denying that it’s a healthy, tasty stock for the non-vegetarians of the world. Begin by placing the bones on a cooking sheet in an oven preheated to 350 degrees Fahrenheit for 30 minutes. Once browned, remove the bones, place them in a large soup pan or slow cooker, and cover with water. Let the bones cool for 30 minutes. Add the celery, carrots, onion, bay leaves, garlic, and peppercorns. Cover with any additional water as needed. Bring to a boil, cover, and reduce heat to simmer for 48 hours. During cooking, stir as needed (maybe every 6 hours or so) and add water to cover as necessary. If you leave the pot uncovered, you will need to add water more frequently, as the water boils off. I find it much easier to cover the pot at least partially to avoid this. This will determine how thick the final stock is. Cook the stock down for 48 hours. Strain off all solids and let cool. Place in the refrigerator overnight. Once cooled, the fat will have congealed on the top. Using a slotted spoon or spatula, remove this fat and discard. Ladle the remaining fluid into small reusable containers or ice cube trays and place in the freezer. The stock can be stored for months and easily heated up to make soup. The stock cubes can be removed from the trays (once frozen), placed in a resealable bag, and used for smaller portion sizes. To use the stock, simply remove from the freezer and place the reusable container under warm water until the frozen stock can be easily transferred into a soup pot. Add water to adjust desired consistency and flavor by adding your choice of meat, vegetables, spices, and salt. You can also use the stock as a tasty drink. Simply place 2-4 frozen cubes in a microwave-safe mug and warm. The broth is delicious, nutritious, and easy on your stomach. Add salt to flavor, but please use sparingly. The more salt you consume, the more you will swell!